2 Add chicken into the marinade, and marinate for a minimum of 3 hours, better overnight. 3 Roll chicken on flour, dip in egg mixture, then coat chicken with bread crumbs mixture. 4 Heat oil to 350 degrees in an deep pan. 5 Fry chicken in the hot oil until the chicken is cooked thoroughly and crispy. 6 In a saute pan, heat olive oil and garlic. 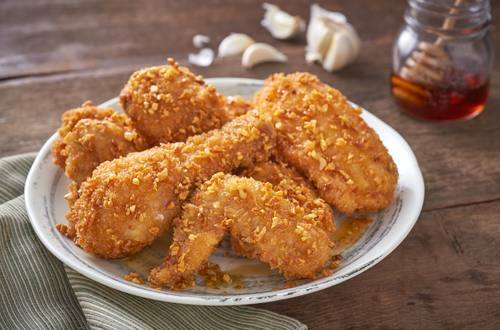 7 When garlic is half cooked, add the crunchy fried chicken and saute. 8 Pour honey on chicken pieces and continue to saute till chicken pieces are evenly coated with honey.